This beautiful poster could be the ideal decoration for your home or office. You can download the original size (DIN A3) and print it to hang it on the walls in your office or wherever you want. 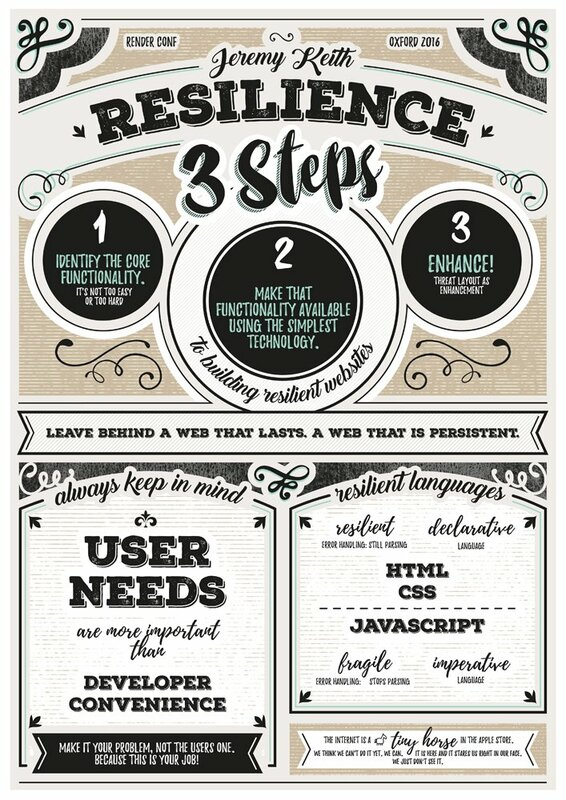 I love this illustration that Jess made of my Resilience talk at the Render conference. ’Sfunny—I was just talking about how important it is to keep document ways of teaching the basics of CSS, then I come across this delightful series of explanations. A profile of a legend. Dan has started writing up what he did on his Summer hols …on a container ship travelling to China. It is, of course, in the form of an email newsletter because that’s what all the cool kids are doing these days. Myth - CSS the way it was imagined. This looks interesting: a CSS postprocessor that polyfills support for perfectly cromulent styles. This is a breath of fresh air: a blogging platform that promises to keep its URLs online in perpetuity.